Programming Tekin ESCs (Electronic Speed Controllers) couldn't be easier with the Tekin Hotwire device. Check out this step-by-step guide! Brilliant, just wish it was waterproof. Great waterproof and poweful ESC. Straight up Power House! If your behind me, check out my rooster tails!! It's a strongest R/C ESC from more than 20 years ago. just cheap and lovely. In 2003 the industry was on the edge of evolving to LiPo batteries and brushless motors. With Tekin’s experience and modern advances in technology came the perfect opportunity to pioneer new products and change the game again. RC racing quickly evolved to what we know today as consistent performance, back to back batteries and long run times. This evolution in technology also allowed more people to enjoy the hobby by reducing the cost and effort per minute of driving time. 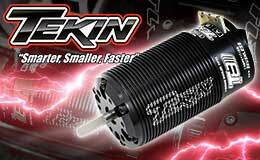 Tekin products are available worldwide and have won numerous Readers Choice Awards in recent years. 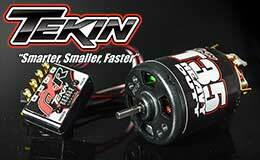 All of our products are unique to Tekin and you will not find them under any other brand. Proudly designing and manufacturing our products in the USA (using foreign and domestic components) allows us to always be listening and constantly improving. We are typically well represented on the podium at any major event or local race, and our team drivers around the world help us test our products and support our customers. 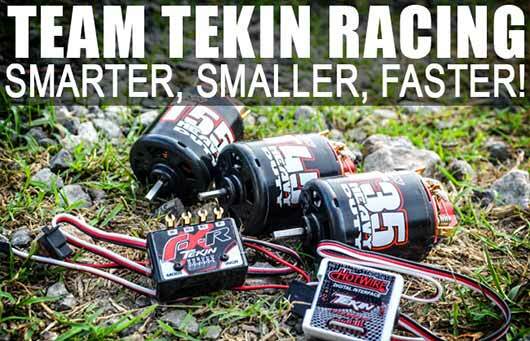 When you choose Tekin products you are joining a family of dedicated people and loyal users that are helpful and just fun to be around.